Curated collections of Bob Dylan's best unreleased recordings. It's springtime in the Northern Hemisphere and that means that it's time to look forward to what the rest of the year will bring. At the moment, in the Dylan sphere at least, that means a Rolling Thunder Revue documentary and an accompanying archival live recording release. Before we get along to finding out what gems Columbia has locked in its vaults, I thought it would be nice to reflect on the era immediately preceding that ramshackle 1975 tour. 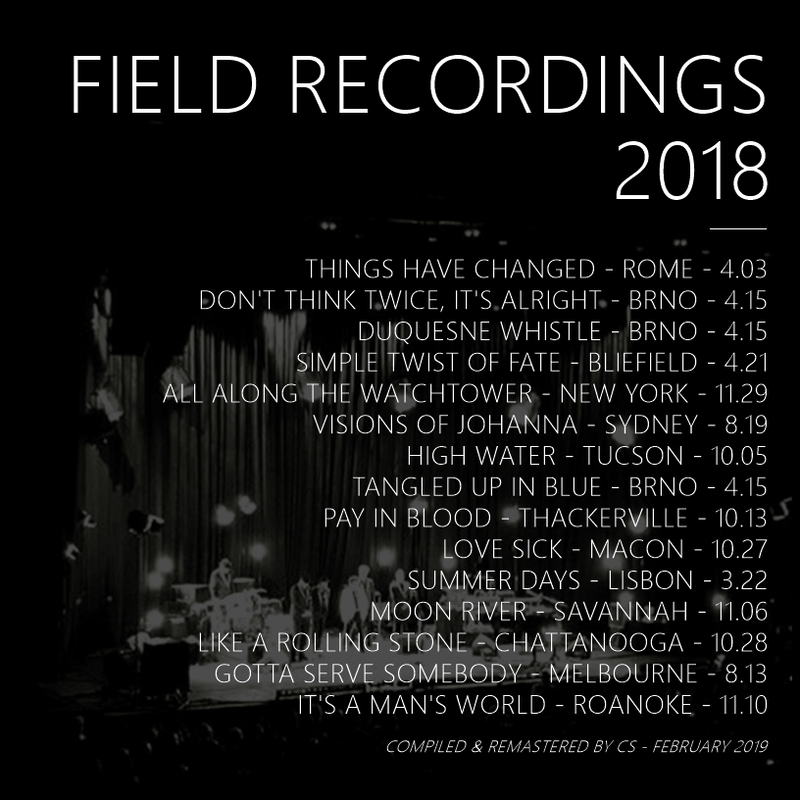 What better way to do so than by building a playlist of the best recordings found on 2018's Bootleg Series Volume 14: More Blood More Tracks (Deluxe Edition) but absent from the standard edition of that collection? This painting-inspired song came to the studio largely intact, though its lyrics would undergo a revision between the 1974's September New York recording sessions (from which much of More Blood More Tracks is drawn) and the December Minnesota sessions which informed about half of 1975's Blood on the Tracks LP. This September 17 performance is interesting largely for its instrumentation. While most versions feature Dylan accompanied only by Tony Brown on bass, Paul Griffin appear on this rendition playing organ. Organ would end up absent from all non-Minnesota recordings on the final album but this offers a window into what might have been. Bob Dylan first played "Simple Twist Of Fate" solo in the studio. The song would then undergo one of the most varied evolutions of the recording sessions in a short period, being attempted unsuccessfully with a full band arrangement - which resembles the arrangement from 1978's live At Budokan album - and then another stripped-down approach with Tony Brown on bass. The performance of the latter arrangement would end up on Blood on the Tracks, but the two early solo takes were the most interesting to me. Of these, the second stands out as most fully realized. It includes an interesting guitar riff between verses that is more prominent on Take 1 but more successful on Take 2; this oddly compelling element would be stripped from the song in later recordings. "Up To Me" is among the most beguiling compositions of the Blood on the Tracks sessions. The song was rightly omitted from the final album, as its most effective performance (found on 1985's Biograph retrospective) heavily resembles "Shelter From The Storm." Its lyrics are often fascinating, containing many of the era's finest couplets, but it has just as many unfortunate filler lines; consider the juxtaposition of "It was like a revelation / When you betrayed me with your touch / I'd just about convinced myself nothin' had changed that much" with the remainder of the fourth verse: "The old rounder in the iron mask he slipped me the master key / Somebody had to unlock your heart, he said it was up to me." The surrealist lines work as an exercise in obsuscation but little else. The remainder of the song, on the other hand, feels like the brutal, beating heart of Dylan's starkest record. This performance is more uptempo than the one that made it onto Biograph and features a vocal performance that takes some time to find its footing; the singer never quite finds the right timing for each verse's final line, but this awkwardness is compensated by an excellent circular guitar line between each verse and an mind-bogglingly warm delivery on the last few verses. Dylan's delivery of the line "baby remember me" in the final verse alone might be among the most beautiful moments captured in these sessions. I don't know if it's a controversial opinion, but I don't care for the New York recordings of "Idiot Wind." The most caustic composition of Blood on the Tracks deserves a fierce reading rather than a self-reflective one. Happily, the song would find its identity in Minnesota and then evolve still further on the road in 1976. More Blood More Tracks finally reveals the song in its true glory with a remix reproduced at the correct speed rather than the comparatively tinny, sped-up version on the original 1975 LP. The Blood on the Tracks version of "Meet Me In The Morning" was recorded with a band called Deliverance during the September 1974 sessions which - outside of abandoned takes on "Simple Twist Of Fate" and "You're Gonna Make Me Lonesome When You Go" - produced few other recordings of note; this process is extensively documented in Andy Gill's excellent book Simple Twist of Fate. Before it would be played with the band, though, Dylan played "Meet Me In The Morning" twice in a striking solo arrangement. The first of these performances appears on More Blood More Tracks' standard edition, but I thought the second was even better. Both takes are highly reminiscent of songs recorded in the 1930s by American blues singer Robert Johnson. "Call Letter Blues" is, like a handful of unrecorded compositions featured in Dylan's legendary 1974 notebook in which much of Blood on the Tracks was originally composed, another fairly straightforward blues song. It shares its underlying structure with "Meet Me In The Morning," though its lyrics are perhaps a bit more (allegedly) autobiographical. 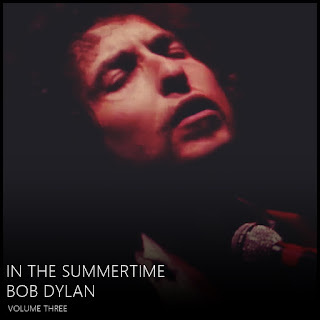 In any case, a complete rendition featuring overdubbed distorted guitar would eventually appear on The Bootleg Series Volumes 1-3: 1961-1991 after failing to appear on the singer's 1975 album. The recording featured on this DIY Playlist, on the other hand, is a very funky early rehearsal with Paul Griffin's piano emphasized in the mix. It's incomplete, but I think I like it even more than the final version. This song was among the sessions' most challenging to record, occupying a full twelve tracks on The Bootleg Series Volume 14: More Blood, More Tracks (Deluxe Edition). It was played solo and in several arrangement with a full band in New York. One of the former would be released on Blood On The Tracks, but I'm partial to this very strange slow version which sounds more like the singer's 1970 New Morning LP than anything he had recorded since then. It's not fully developed, but is a very warm recording of a very warm song. The arrangement is actually surprisingly similar to one briefly attempted at rehearsals for Bob Dylan's 1978 World Tour. No other recordings remain extant from the December 1974 Blood on the Tracks sessions than those which would appear on the final album. This is a shame, though rumor has it that only one take ever existed of "Lily, Rosemary And The Jack Of Hearts." This is astounding, given the song's length, but session musicians claimed that the singer had simply told them to keep playing and they'd followed his orders. Whatever the case, the song's uptempo full-band arrangement is miles ahead of its two comparatively lugubrious outings in New York. By 1974, Bob Dylan had played this quasi-cover song several times (at 1968's Basement Tapes and 1970's Self-Portrait sessions). The latter had even produced an unfortunately over-produced take published on 1973's Dylan LP. Most of the song's outings, whether in the recording studio or live, are similar to this version: a genuinely mournful reflection on lost love. I don't think the slightly truncated performance from the Blood on the Tracks sessions is as successful as it had been in 1968, 1970, or 1976, but it is engaging in its own right. One wonders if it had inspired Dylan's own new composition "If You See Her, Say Hello." That song is absent on this DIY Playlist, since the best version of the song already appears on More Blood More Tracks standard edition, but I think its content is represented well by "Spanish Is The Loving Tongue." "Shelter From The Storm," alongside "Tangled Up In Blue" and "Simple Twist Of Fate," would go on to become one of the singer's most regularly-performed compositions from this era. It would be rearranged again and again, though the performances from September 1974 are strikingly uniform. One exception exists, however: the first take of the song includes a prominent Paul Griffin piano fill between each verse. An additional verse is included, too, though this is not unique to Take 1. Some listeners have expressed happiness that the piano was omitted from the version which graced the final album, but I'm always excited to hear a little more Paul Griffin. Along with "You're Gonna Make Me Lonesome When You Go," "Buckets Of Rain" took a surprisingly long time to record in New York. The song is deceptively simple - it is short by the album's standards, and has none of the acidic wordplay which characterizes Blood on the Tracks most memorable tracks. 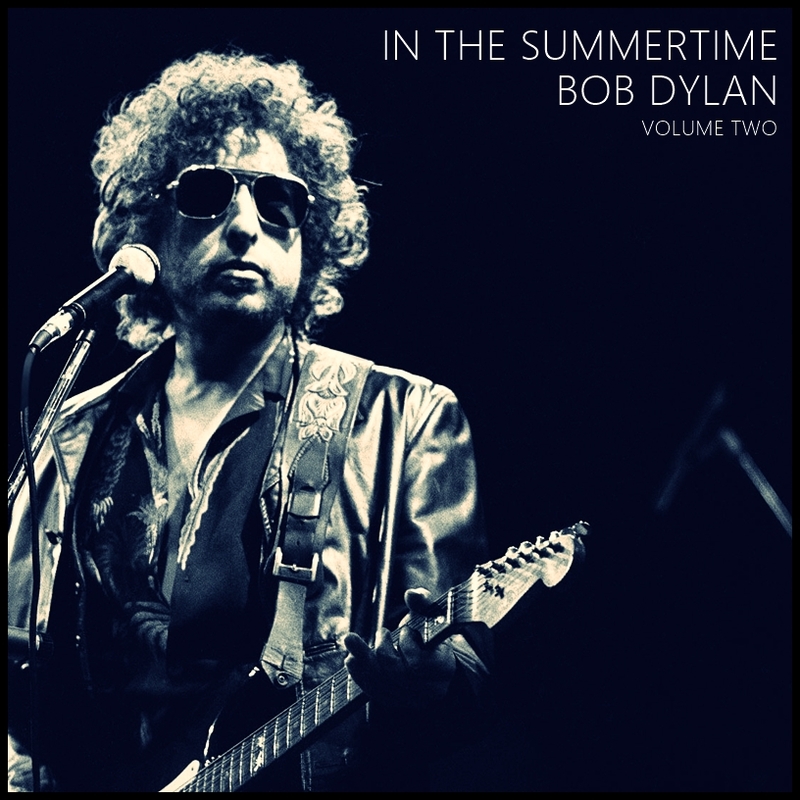 Its guitar line seems to have bedeviled Dylan, however, and more than a few takes feature missed notes or lyrics. Take 2 is one of the most successful, however, perhaps offering an even more textured palette than the version chosen for the standard edition of More Blood More Tracks. Whatever your preference, I think you'll enjoy this disarmingly charming performance. I hope that you, like me, enjoyed this dive into Columbia's archives. More Blood More Tracks was less thrilling than 2017's Trouble No More, but it still offered quite a bit of fascinating material to explore. It's always an engaging process to listen to a supremely skilled musician developing a masterpiece in the studio. The final album is unparalleled, but these outtakes are pretty great too. Until next time, keep yourself healthy and listen to some good tunes. In 2018, Bob Dylan made a few major changes to his live performances. A repertoire of ballads popularized by Frank Sinatra gave way to more original compositions by mid-year. 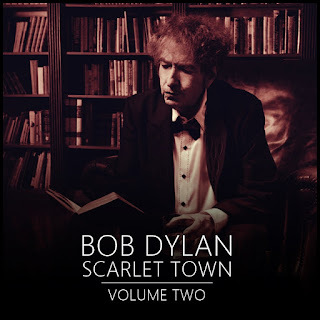 This came as a relief to some fans who had tired of the moody style Dylan had employed since 2015, though others lamented the replacement of these covers with songs largely pulled from the singer’s 2012 to 2014 setlists. 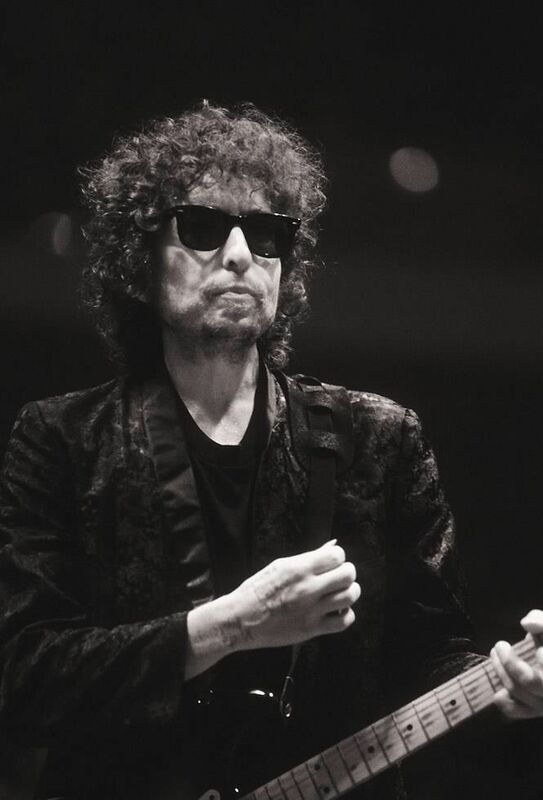 By the end of the late summer Pacific Tour, however, Dylan and his band had begun to offer more surprising fare: “Gotta Serve Somebody” and “When I Paint My Masterpiece” would become setlist standards for the first time since 2001 and 1991 respectively. More importantly, the spirit of experimentation which characterized song arrangements the Fall 2017 Tour persisted through 2018. “Honest With Me,” “Summer Days,” “Tangled Up In Blue,” “Thunder On The Mountain,” and “Tryin’ To Get To Heaven” retained their distinctive 2017 arrangements while entirely new styles were applied to “Don’t Think Twice, It’s Alright,” “Pay In Blood,” and “Gotta Serve Somebody” mid-tour. The first “Gotta Serve Somebody” arrangement, which was played only briefly on the Pacific Tour and appears on Scarlet Town Volume Two, is heavily influenced by Henry Mancini’s “Theme From Peter Gunn.” The later arrangement, which was played for the remainder of the Pacific Tour and throughout the following United States Tour, owes more to the American boogie woogie musical style. The arrangement of “Cry A While” is very similar to Link Wray’s instrumental “Rumble,” which Dylan played several times at a London residency in 2005. “Like A Rolling Stone” is a fascinating fusion of old and new, with a scaled back chorus reminiscent of the 1976 Rolling Thunder Revue’s start-stop arrangements. 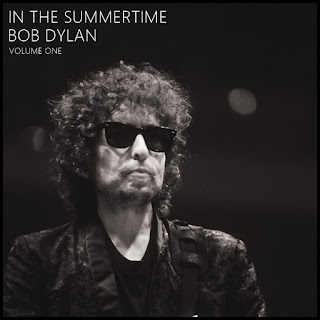 “Things Have Changed” was updated slightly at the start of the Fall Tour, as the portion of the verse immediately preceding its chorus now has cascading drums in the style of “Beyond Here Lies Nothin’.” Dylan seemed to have grown more comfortable with being highlighted in the mix, especially on the Fall 2018 Tour, as lengthy portions of “When I Paint My Masterpiece” and “Don’t Think Twice” feature him playing piano and singing with little band accompaniment. 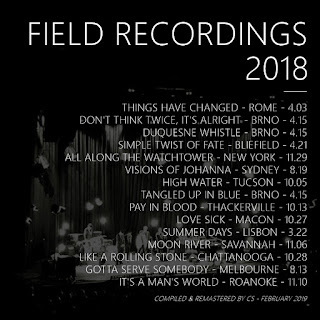 The Fall Tour also brought with it a few new covers. For the first time since 1990, Bob Dylan sang the famous ballad written Harry Mancini and Johnny Mercer and popularized by Andy Williams. It debuted at Savannah’s Johnny Mercer theater, likely as a nod to the theater’s namesake; I prefer to think that it was inspired by The Simpsons’ episode “Bart on the Road,” as it was indeed played as a second encore. “It’s A Man’s World” was also played by Bob Dylan for the first time in his career at Augusta on November 7 before appearing three more times. This intense James Brown and Betty Jean Newsome song closed out the concert each time it was played. A few neat oddities popped up throughout the year, as they tend to. “Visions of Johanna” was played once in Sydney. The arrangement is lovely, and a rumor circulating at the time suggested that the song was a tribute to the cast of Rigoletto; Dylan had recently visited the Sydney Opera House to take in that performance and chatted with the cast backstage. “High Water” was played six times throughout the year in two different arrangements. One rendition of the latter one, uncharacteristically performed in a major key, is included on Scarlet Town. The highlight of the Fall Tour, as indicated by many in attendance, was a rearranged version of 2012’s “Scarlet Town.” The structure remains similar to the song’s studio recording, but the final line of each verse is lengthened for dramatic effect. By the mid-point of the track, a distinctive guitar riff begins to amp up the menace. George Receli’s complex rhythm accompaniment enhances the song still further, and I found that this was represented best on a New York recording late in the year. As you can imagine, I enjoyed Bob Dylan's increasingly experimental 2018 tour. 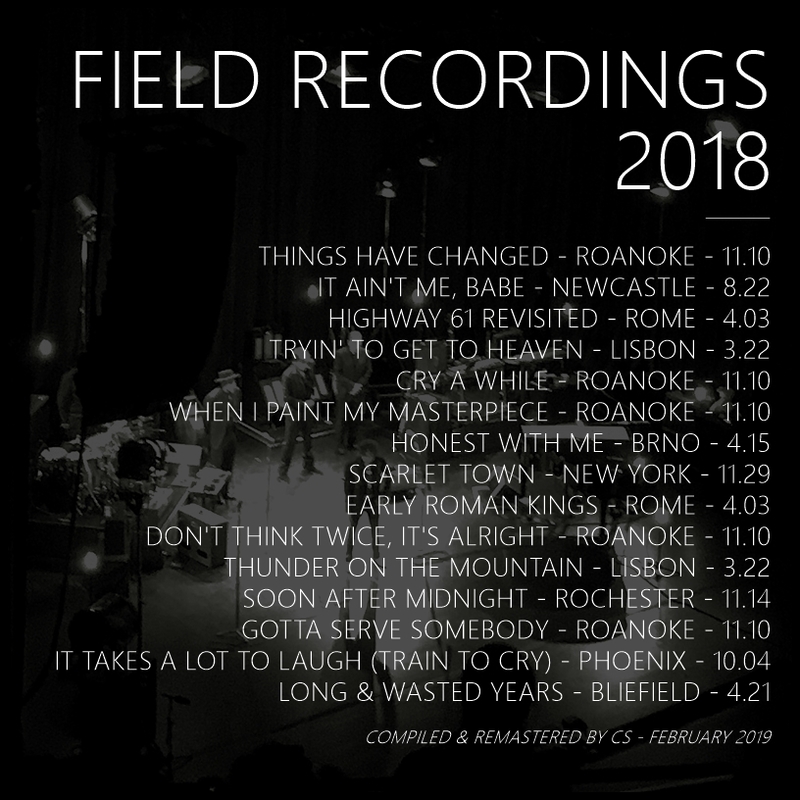 A 2-CD compilation of the best 2018 live recordings will be coming to Thousand Highways on February 1, 2019. I'll also be putting out a handful of DIY Collections at a bimonthly interval afterwards. Check in on the 1st of each even-numbered month in 2019 for a new one. I'm looking forward to sharing some great music with y'all this year. Until next time, keep yourself healthy and listen to some good tunes. Welcome to a long-delayed DIY Playlist. This time we turn our attention to Bob Dylan's live tours from 1971 to 1981. These tours are, by a significant margin, the most-documented by Sony/Columbia's official releases, so narrowing it down was an exceedingly challenging prospect. Still, I think you'll enjoy the result. By the end of 1972, Bob Dylan had been more or less off the road for six years with a handful of notable exceptions: the Woody Guthrie Memorial Concert in 1968, the Isle of Wight Festival in 1969, and the Concert for Bangladesh in 1971. These shows were oddities in their own right, as Dylan played Guthrie songs backed by The Band at the '68 show and songs in his distinctly country-flavored Nashville Skyline guise during the '69 set. Only the Concert for Bangladesh offered a glimpse of the classic performer fans had come to love during the 1960s, and even that was brief as Dylan played just a few songs. Following in this fashion, Bob Dylan made a surprise appearance at The Band's New Year's Eve show on December 31, 1972. He and the other musicians seem to have been dipping pretty thoroughly into celebratory beverages, as the night's rendition of "Like A Rolling Stone" is barely coherent. On the other hand, his more recent compositions end up sounding much more effective. Before it would go on to become the opener at every night of 1975's Rolling Thunder Revue, "When I Paint My Masterpiece" was debuted on-stage by Dylan during this 1972 guest appearance. It is perhaps his first newly written piece of the decade, and I thought it a lovely place to begin this look at how he evolved over the following ten years. "It Ain't Me Babe" would be played after "When I Paint My Masterpiece" in every Bob Dylan set on the Rolling Thunder Revue's 1975 tour. It seems only natural that it do so here, even if the preceding song was recorded three years earlier! This peculiar, quasi-calypso arrangement of "It Ain't Me Babe" was a consistent highlight due in no small part to the idiosyncratic instrumental duets anchoring the song's back half. With regard to the recording, the performance from Cambridge on November 20, 1975 has been released in two very different mixes: the earlier version appeared on the 4 Songs From Renaldo & Clara LP in 1978 and Live 1961-2000 in 2001, while a remixed version appeared on 2002's The Bootleg Series Volume 5: The Rolling Thunder Revue - 1975. Many fans swear by the earlier mix, finding the latter too bright, but I think both are excellent; given the difficulty in getting a digital copy of the earlier mix, I recommend settling for the remix from 2002. As with the preceding song, live performances of "Romance in Durango" have been released several times over the years. In fact, I suspect the song's inclusion on 1985's Biograph is primarily down to the fact that it is a dramatic improvement on the studio rendition featured on Desire. In any case, I think the version from Montreal that appears on Biograph is narrowly superior to the one from Cambridge that appears on The Bootleg Series Volume 5: The Rolling Thunder Revue - 1975. Both are easily accessible in digital form, thank goodness. Whichever way you get it, I think you'll enjoy the live arrangement of this homage to Marty Robbins' "El Paso". At the end of 1978, Bob Dylan converted to Christianity. This had a profound impact on his music, leading him to exclusively play new gospel compositions throughout much of 1979 and 1980. One of the most notable residencies during these tours - indeed the best-recorded one - is a five-night stint in Toronto during April 1980. 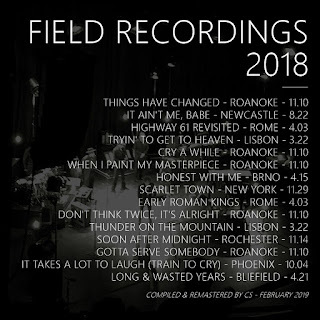 A compilation of the best performances from this residency makes up Discs 5 and 6 of the singer's 2017 Bootleg Series release, and it's genuinely spectacular. To represent that set, I've picked out "Solid Rock". This song was a consistent high point of Dylan's shows from 1979 to 1981, but I think the one from Toronto might be the best I've heard. Its lyric are derived primarily from the Gospel of Matthew 25:34 and the Book of Isaiah 53:3-5. "Oh Sister" is one of the first songs from 1976's Desire to be played live, as it was debuted alongside "Hurricane" at an abbreviated performance by Bob Dylan on The World Of John Hammond in September 1975 (though this live rendition would not be broadcast until after the first leg of the Rolling Thunder Revue in December 1975). The lyrics of the song are not particularly strong, but Dylan consistently displayed his ability to transform a mediocre composition into an incredible performance piece on-stage. Happily, Columbia Records published a version from the Rolling Thunder Revue's 1976 Tour on that year's Hard Rain. The recording quality, particularly at the song's start, leaves a bit to be desired, but the raw passion shines through nonetheless. Interestingly, the song's acknowledgment of a heavenly Father also seems to unintentionally foreshadow the singer's conversion several years later. Most fans would have first discovered Dylan's newfound faith through the song "Gotta Serve Somebody," as it opened his first gospel LP in 1979. Similarly, the song opened almost every one of his shows between 1979 and 1981, becoming something of an anthem for its writer. Its arrangement would also shift over time, moving from a sprightly uptempo affair to a moodier midtempo piece in the studio and then from a straightforward rock song in 1979 to an arrangement featuring a Bo Diddly-esque beat in 1981. The recording I've selected for this playlist features the singer at the height of his incisive vocal precision during 1979's Fall Tour. The song itself seems to be inspired by Memphis Slim's "Mother Earth," first published in 1951. The metallic, jangly sound of 1976's ramshackle Rolling Thunder Revue Tour is captured nowhere better than this reckless take on Blonde on Blonde's "Stuck Inside of Mobile with the Memphis Blues Again." The arrangement is as far from that studio take as can be, seemingly influenced by cantina bands in the American Southwest. This was actually the version of the song that I first heard, and indeed remains my favorite performance. 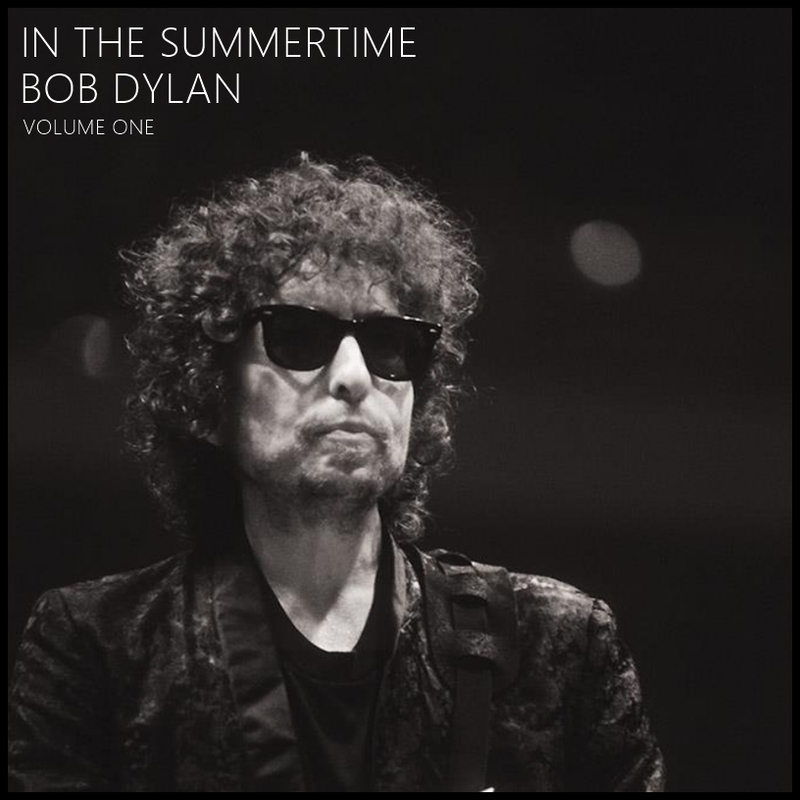 Surprisingly, the drums and some backing vocals seem to have been dubbed in later due to a problem with the recording - according to Sid Griffin in Shelter From the Storm: Bob Dylan's Rolling Thunder Years, tour drummer Howie Wyeth and engineer Don Meehan overdubbed drums and backing vocals, respectively, as the album was mixed. "Mr. Tambourine Man" is one of two songs on this DIY Playlist to be drawn from the singer's surprise appearance at George Harrison's Concert for Bangladesh in 1971. The titular country was in the midst of a horrifying combination of civil war and drought, and former Beatle George Harrison organized the world's first large-scale benefit concert to route much-needed money to Bangladeshis. Though Bob Dylan had turned up at the soundcheck as a favor to Harrison, he expressed trepidation at the crush of press and was unwilling to commit to an on-stage appearance. To Harrison's great relief, however, Dylan overcame his anxiety and helped the cause with a five-song set at both benefit shows on August 1, 1971. Bob Dylan had appeared at two shows between 1969's Isle of Wight Festival and the beginning of 1974, but these collectively amounted to less than a single complete concert. Al Kooper, the keyboardist from Blonde on Blonde and New Morning, claims that a tour was planned and even rehearsed for in 1970 but was abandoned prior to scheduling dates. By the middle of the decade, though, Dylan was ready to go out on the road with The Band. These musicians had backed him on tour in 1966 as The Hawks and at all of his special appearances from 1968 to 1972, but their sound had evolved by 1974. Dylan's singing style had also evolved, and the combination of propulsive backing music with an over-emphatic singer was disappointing for fans who had been awaiting a new tour for much of the preceding decade. The tour's least-effective later dates were extensively documented by Columbia on 1974's Before the Flood, and a handful of tracks stand up to scrutiny - the first of these is actually the first track from that album, an intense arrangement of Blonde on Blonde's "Most Likely You Go Your Way (And I Go Mine)". "One Too Many Mornings" represents one of the rare occasions when Bob Dylan has altered the lyrics to one of his 1960s songs. This practice would become common with compositions written from 1971 to the 2010s, but lyrics drafted in the singer's first decade have generally been sung as recorded in-studio. Partway through Dylan's 1976 tour, however, he would add half of a verse to The Times They are a-Changin's "One Too Many Mornings." The other half of the verse remained instrumental, and the rewritten lyrics would never appear again after 1976. In Fall 1980, Bob Dylan reintroduced covers and pre-1979 compositions back into his setlist. New tracks were also debuted, and the singer was writing entirely secular songs by the following year. "Heart of Mine" is one of these songs devoid of any apparent spiritual character. During the Summer 1981 Tour, the song often featured Dylan on organ; by the Fall 1981 Tour, however, it had reverted to an arrangement reminiscent of the one which had appeared on Shot of Love. The song was rarely a concert highlight, but a noteworthy exception was selected by Columbia for 1985's Biograph retrospective. This performance originates at a New Orleans show from November 10, 1981, which was also the source for a version of "Dead Man Dead Man" released as the b-side to 1989's "Everything is Broken" single and re-released on Live 1961-2000 in 2001. As in 1974, Bob Dylan's 1978 Tour of Japan ended up less effective than the shows that preceded or followed it. The concerts from the early part of 1978, which were cataloged on At Budokan, were characterized by stilted over-embellished arrangements, and fans are still awaiting a release covering the year's later dates. "Don't Think Twice, It's Alright" is one of the album's successes, though - the 1962 classic had only been performed previously as an acoustic solo track, but it's inexplicably reinvented here as a reggae song. Interestingly, At Budokan was originally intended only for Japanese audiences as a souvenir of the tour; it was only after requests by Western fans that Columbia released the album outside of Asia. "Isis" is one of fans' favorite songs from Desire and the Rolling Thunder Revue tours. A version would be included on The Bootleg Series Volume 5: The Rolling Thunder Revue - 1975, but the best rendition published by Sony/Columbia appeared on 1985's Biograph. 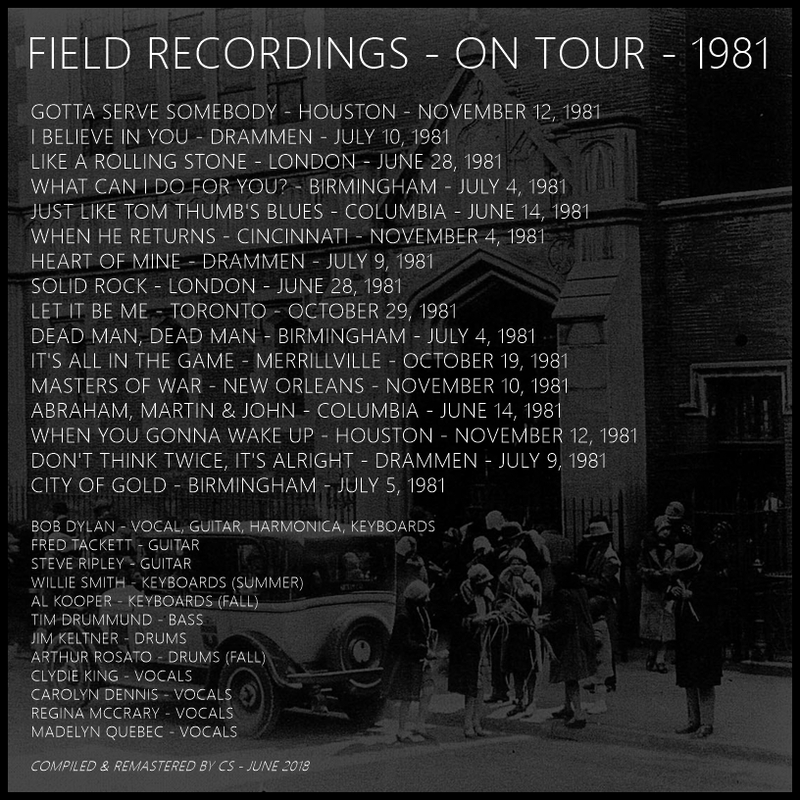 A film of that performance, from a 1975 Montreal concert, also appeared in 1978's Renaldo & Clara and as a bonus DVD included in 2002's The Bootleg Series Volume 5. Many songs were reimagined by Bob Dylan and his band throughout the 1981 tour, but few were as profoundly successful as "Girl from the North Country." The song had typically been performed as a solo acoustic track in the 1960s and 1970s, but an organ-oriented arrangement had debuted in 1978. Once the song returned to Dylan's setlist in 1981, it had become a fusion of these two styles. "The Groom's Still Waiting at the Altar" was written in 1980 and performed five times on the Fall 1980 tour, after which it would never again be played live. The arrangement from 1980 is slower than the one eventually released on a re-release of Shot of Love in 1985, and has a largely unique set of lyrics; even the chorus is different! 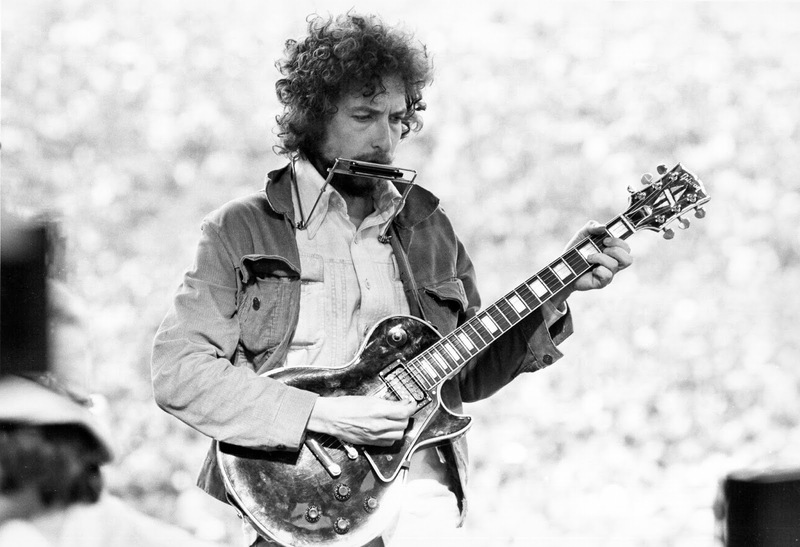 Dylan frequently featured guest guitarists on his 1980 live performances of the song, including Carlos Santana, Jerry Garcia and Michael Bloomfield. The latter recording was released on a 2014 Michael Bloomfield retrospective, and is the one I've decided to include on this DIY Playlist. Bloomfield's powerful guitar improvisation manages to elevate the already-exceptional song to incredible new heights. Bob Dylan has never sounded more like a traditional gospel performer than in "Pressing On," which closed most of his concerts from 1979 to early 1980. Unlike the version that would be released on 1980's Saved, the live arrangement builds gradually and is largely a duet of piano and vocals. The lyrics are inspired by the Gospel of John 6:30 and the Gospel of Mark 6:11. This song opened he Bootleg Series Volume 5: The Rolling Thunder Revue, but never actually opened a show on the 1975 tour represented by that album. It was instead performed about halfway through Dylan's first set. In fact, according to Clinton Heylin, the cheers from the audience when the words "rolling thunder" are sung have been overdubbed as well. Despite being something of an artificial construction, the song is outstanding as an introduction to what comes after. This is another of the four songs played by Bob Dylan and The Band at their New Year's Eve 1972 show, and is every bit as good as "When I Paint My Masterpiece." Unlike that recently written song, it's a funky rearrangement of a Basement Tapes track from 1968. The horn section is a lovely addition, and makes the song's appearance here one of its most effective outings despite Dylan and The Band not being entirely in sync on their harmonies. "Love Minus Zero/No Limit" received a jarring, flute-oriented arrangement on the 1978 tour. It would end up being played primarily in the Spring, disappearing from the setlist later in the year, and I suspect much of this is down to the constricting of the singer's vocal capacity as the long tour went on. This weird arrangement would prove to be something of a one-off, and the song would return to being played as a more stately ballad in later years. The studio version of "One More Cup Of Coffee" that was released on Desire is one of that album's highlights, but the song would only grow in stature throughout the 1975 Rolling Thunder Revue tour. In particular, Scarlett Riviera has the opportunity to improvise extensively with her violin and Dylan renders his vocals more adventurously on-stage than he had when laying down tracks for Desire. The song would go on to be rearranged with bongo accompaniment in 1978 and occasionally as a dark rock ballad on the Never-Ending Tour, but the strangest rearrangement would be the song's appearance in 1976 as an acoustic guitar/violin duet. "Seven Days" was never recorded for an album, but was instead used as a performance piece at several shows in 1976 before being offered to Ron Wood for the 1979 album Gimme Some Neck. It was played by Wood at the Bob Dylan's 1992 30th Anniversary Concert and was revived again on the Never-Ending Tour in 1996. The lyrics never seem to have been completely nailed down, humorously enough. "When You Gonna Wake Up" is not a particularly appealing song in its studio guise on Slow Train Coming, but would become a centerpiece of the singer's concert setlists throughout 1979 to 1981 and then again in 1984. During that time, it would evolve from a heavy gospel track to a percussive arrangement in 1981 (included here) to a rock ballad in 1984. Its lyrics would also be revised, though only the 1984 version features a significant overhaul. The song made its final appearance in 1989 as an inexplicably piano-oriented one-off but the lyrics to that performance are unclear. Though many of Bob Dylan's gospel compositions feature backing vocals and a loud band, a handful are quieter. The core ballad of this period is Slow Train Coming's closing track, "When He Returns." 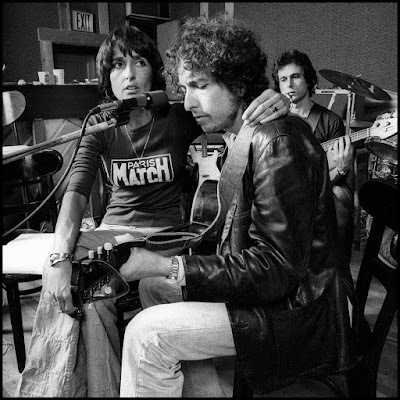 The song was intended to be recorded by Dylan's backing vocalists without his participation before being attempted as a full-band arrangement and then finally captured as a vocal/piano duet. Fans are lucky that it was not abandoned, given that it underwent such a radical evolution in the studio, and it the song would go on to become a major showpiece for Dylan's vocals throughout 1979 and early 1980. The song is a title track to one of Bob Dylan's most significant albums, but "Highway 61" would very rarely be performed on-stage prior to 1984. Indeed, the only tour on which it regularly appeared was 1974's tour with The Band. The arrangement plays to that tour's strengths, featuring a powerful rock sound and expressive, energetic vocals. Unlike its debut at 1969's Isle of Wight, this rendition features God's request for Abraham to "kill [him] a son" rather than "give [him] a son". From one Highway 61 Revisited track to another! This one is toned-down, however, rather than being blown up as its predecessor had. Dylan is backed here by George Harrison and Leon Redbone at the Concert for Bangladesh. The song is a stripped-down take on the arrangement featured on the published Highway 61 Revisited rather than the energetic arrangement that the song would have on-stage at Newport in 1965 or in its early studio rehearsals. "Slow Train" is the title track from Bob Dylan's 1979 album, and would be played in concerts regularly from his first show in 1979 until 1989. It would undergo a number of major rearrangements during that time, if not rewrites like "When You Gonna Wake Up," but the version I've included here is very similar to the studio version. Improving on the basic studio take, it features appropriately apocalyptic vocals and blazing lead guitar by the characteristically-reserved Fred Tackett. Bob Dylan tried playing slide guitar on-stage for the first time in 1976. The results could have been disastrous, but Dylan's messy style befits the reckless approach to Blood on the Tracks' beloved "Shelter from the Storm." Like "Oh Sister," this song includes some biblical allusions that perhaps unintentionally point towards the gospel tracks recorded in 1979 and 1980. It is arguably closer to the singer's compositions from late 1980 and 1981, in which the secular has begun to blend with more overt religious references. Whatever the case may be, Bob Dylan's vocals when playing this song on his 1976 tour are among the very best in his long career. Contrary to its origins as an apocalyptic poem set to an acoustic guitar, Bob Dylan played this song as a Muddy Waters-influenced blues-rock track with the Rolling Thunder Revue in 1975. It would revert to a more standard arrangement in 1976, but its versatility had been established. By 1981 it had been rearranged again, though it would never be played in as idiosyncratic a style as it was in 1975. "Caribbean Wind" is often seen as the singer's great lost masterpiece. It faced an odyssey in the recording studio, being rearranged multiple times before being abandoned entirely. In the midst of this transition, it was played a single time on-stage at the request of author Paul Williams in Fall 1980 after Dylan showed him the lyrics backstage. Fans were blessed with the most effective version (of the four circulating as of Summer 2018), though the singer appears to have been less happy with it - he mused afterwards that "I don't know if we did that any good. I don't know if we got off or not." 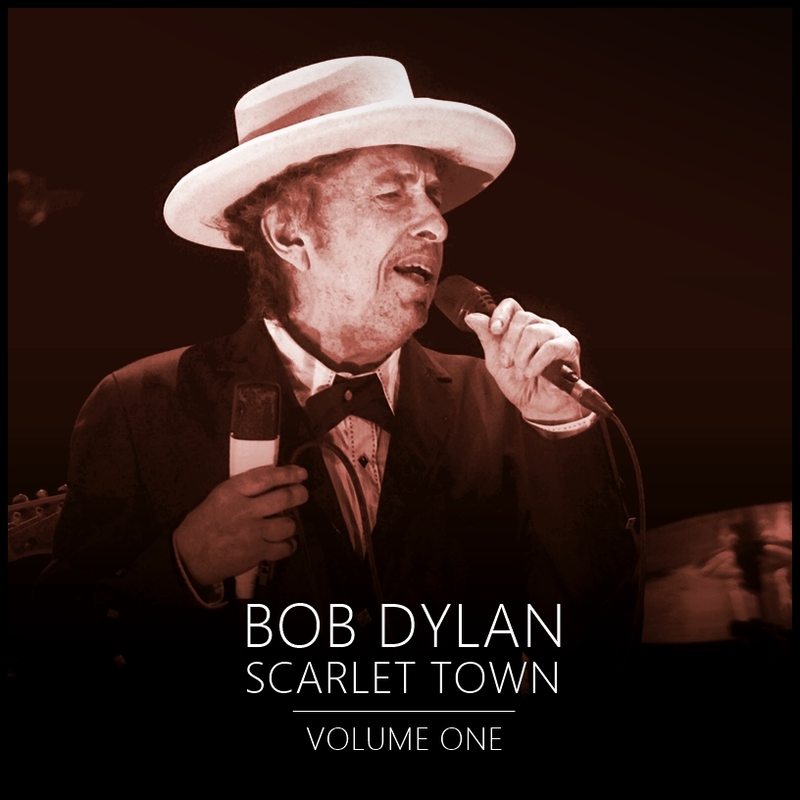 In spite of Dylan's reservations about the performance quality, the song is absolutely transcendent in its single live appearance. As a bonus, please listen to the song's fascinating introduction in which the singer muses about Leadbelly and fan response to musicians' changing styles; this was not included on Trouble No More due to an error in the soundboard recording. The brutality of "Idiot Wind," originally recorded in both acoustic and electric arrangements for 1974's Blood on the Tracks, was most clearly conveyed by the versions played on tour in 1976. The acoustic version had foregrounded the song's sadness more than its anger, while the electric studio version lacked the raw power that could be produced by a large band on-stage. At the same time, the lyrics have been re-written to lean into the singer's rage at the song's target. The live track closed out 1976's Hard Rain, and I can think of no way better to close out the main portion of this DIY Playlist. It's a ten minute roller-coaster ride that's worth every moment. Finally, this acoustic track functions as something of a palette-cleanser after the intensity of what came before. Dylan's shows throughout the '70s tended to be characterized by power and aggression, but a couple of songs were played most nights in an acoustic guise. These were often intensely expressive, featuring some of the singer's warmest vocals since his early folk days in New York City. In many cases, they come across as more naked and honest than even those early recordings. This performance of "It's All Over Now, Baby Blue" manages to convey a very different sense of weary meaning than the wild, experimental renditions played in 1966 - it's incredible that a singer can totally reinvent the sound of a song while still only using his voice and a guitar. That bold sense of reinvention is, of course, the key through-line in Bob Dylan's career from 1971 to 1981. There would be experimental period before and after, but these ten years feature the singer at his most adventurous, exploring various genres and arrangements without regard for what came before. I hope you enjoy listening to the resulting live performances as much as I do! With regard to fades and volume, this one is something of a mess. Several of these albums feature songs that flow from one into the next, as if it was a complete concert - consequently, the transitions on the playlist will be jarring. Additionally, some songs are louder or quieter than others: "The Groom's Still Waiting at the Altar" and the Bootleg Series Volume 5 & Hard Rain tracks are quite loud, while the Biograph recordings and the Bootleg Series Volume 13 tracks are quieter. You can alter these in a sound editor (I use Audacity), or simply keep one hand on the volume button. Until next time, keep yourself healthy and listen to some good tunes. 1981 is my favorite year of Bob Dylan's touring career. Consequently, I've put quite a bit of time and attention into this uncharacteristically lengthy entry in the Thousand Highways Collection. The third and final year in Bob Dylan's so-called 'gospel period' is a peculiar, unique experience. The early days of the tour were actually quite reminiscent of the preceding Musical Retrospective Tour of Fall 1980. Note the appearance on Volume Three of "Abraham, Martin & John," which was played only twice in 1981 after being featured regularly throughout the earlier tour. Other songs shared between Dylan's four appearances in the United States during June 1981 and his popular return to secular performances between November to December 1980 after a year of pure gospel were "Rise Again," "Covenant Woman" and "We Just Disagree." These tracks would disappear from the set after the singer set foot on European soil for a Summer tour, and the new year would quickly acquire its own identity. Most conspicuously, a Caribbean influence pervaded Dylan's sound. Tracks which had formerly been compellng but staid, like "I Believe In You," somehow grew in power after receiving more idiosyncratic vocals and a more complex drum pattern courtesy of Jim Keltner. 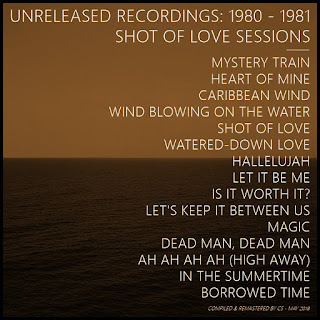 The new tracks, which would be published on Shot of Love in August 1981, were a consistent highlight of the concerts and contributed to the Caribbean flair. As he'd done during the Rolling Thunder Revue in 1975, Dylan managed to put across these new songs even more powerfully on the road. The recent Trouble In Mind, by Clinton Heylin, presents a narrative of the tour running out of steam as it moved from Summer to Fall. I disagree wholeheartedly with this assessment, much as I respect Heylin's research into the unreleased recordings of this time period. 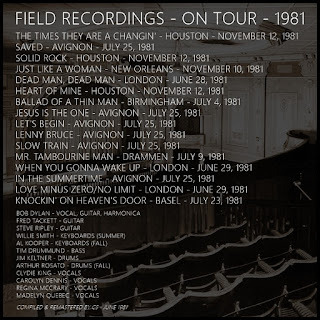 The Summer shows are incredible - Avignon is among the best recordings of the singer's career - but Fall includes a more bizarre setlist and increasingly on-the-edge performances. Check out the seemingly Cheap Trick-influenced "I Want You" or the passionate "Lonesome Death of Hattie Carroll" for a look into Dylan's idiosyncratic reinventions of classic songs. 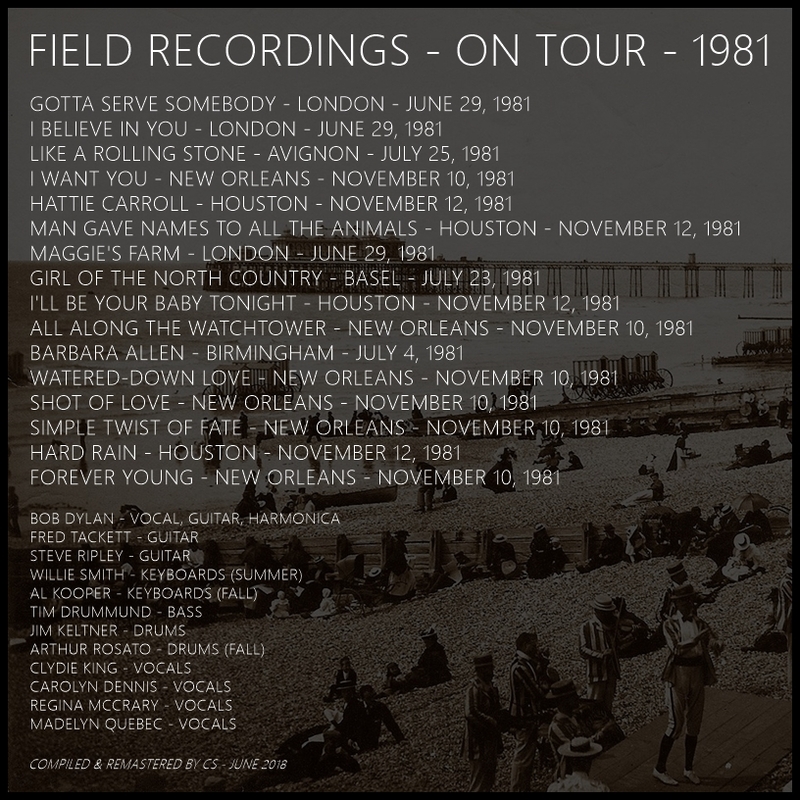 A soundboard recording of New Orleans, mixed by studio legend Daniel Lanois, circulates in fan circles, but my favorite show from the Fall Tour is Houston. Introduced by Hugues Aufray, a French artist and fan, Dylan performed a particularly loose concert to the enthusiastic Texas audience. The show circulates in a lossless audience recording, but I have opted here for the comparatively lossy cassette master that sounds absolutely magnificent to my ears. As his performances grew in unique arrangements - consider the total reinvention of "Mr. Tambourine Man" featured in Drammen on July 9 - Dylan also grew uncharacteristically talkative with his fans. At Columbia on June 14, he offered his amusing if condescending assessment of a writer penning a biography of him. At Avignon on July 25, on the other hand, he lauded fans who had followed the tour from Toulouse. At London on June 26 he offered insight into how quickly "Lenny Bruce" had been written (two minutes), and at Nasvhille on November 14 he reminisced about how dangerous the city was for a man with long hair when he'd recorded Highway 61 Revisited in 1965. In my favorite instance, he mused about the ascent of computers and their role in air traffic at Houston on November 12. All in all, it's a lovely year for the singer's on-stage commentary. The first two volumes here are intended to represent something of a standard show. As Paul Williams notes in his inimitable Performing Artist series of books, Bob Dylan's 1981 tours were something of an anomaly. Rather than focus on a single element of the singer's career - either a self-conscious career retrospective like 1974 or 1978, or an emphasize on recent albums like 1966 or 1975 - this year would be uncharacteristically free of such constraints. Setlists were clearly used, as many song sequences remained the same throughout the year, but the overall selection of songs would be wider than anything that had come before. 1981 was a year where the singer seems to have felt untethered by expetations: he played songs from his upcoming (or recently released) record, but didn't dwell on it, while looking to the past through a new lens. The third volume instead focuses on tracks which didn't make the initial selection. Some of these have been included on other Thousand Highways compilations and I wanted to centralize them here. Others, like an unsuccessful yet entirely unique full-band performance of "When He Returns," are new to my collection. "Gotta Serve Somebody" represents the surprising fact that the song went from the exciting rearrangement that appeared on the Summer Tour to a more straightforward, if charmingly rendered, arrangement from the following Fall Tour. "Solid Rock" moved in the opposite direction, as it was performed in a guise reminiscent of 1979-1980 during the Summer but was rearranged as a slow funk crawl in the Fall. Other tracks appear here which sadly lacked better-quality recordings - "It's All In The Game" and "Let It Be Me" chief among these - while "Heart Of Mine" is an intriguing look at what might have been: Dylan played organ on the up-tempo Summer 1981 performances of this Shot Of Love single, but it reverted to a more standard arrangement on the Fall Tour. I hope you enjoy this selection of songs. I absolutely adore Bob Dylan's 1981 live performances, and I'll admit a touch jealousy for those who had the chance to attend them in person. Still, I'll remain content with this surprisingly extensive set of beautiful recordings. Until next time, keep yourself healthy and listen to some good tunes. I haven't forgotten you all. 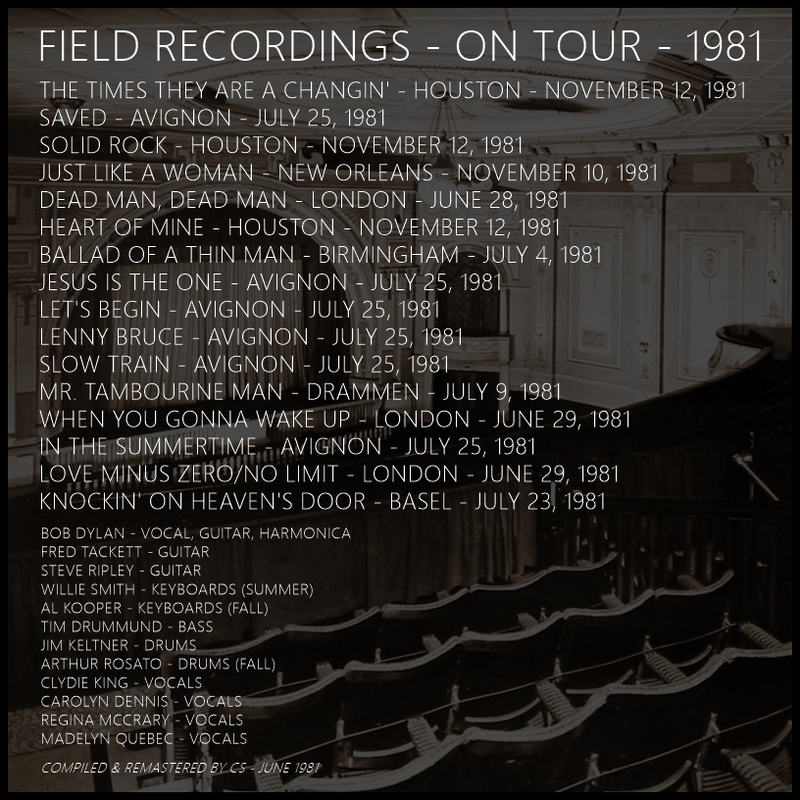 The new collection should have posted yesterday, wrapping up our re-exploraiton of the gospel years in light of Sony's 2017 release of Trouble No More: Live 1979 - 1981. Unfortunately, I started a new job in the past month (after ten years at my last one!) and have been more than a little distracted. This is all the more challenging because 1981 is my favorite year of Bob Dylan's touring career and I really want to do it justice with an expanded set. Consequently, I have an exhaustive three-volume set coming to you soon. I'm still putting the finishing touches on it, but it should be ready by June 15. Check back in on that day and I'm sure you'll find an exciting new chapter of the Thousand Highways Collection. Until then, keep yourself healthy and listen to some good tunes. Welcome to a lovely and oft-overlooked corner of Bob Dylan's recording career - the sessions that led to 1981's Shot of Love. Shot of Love is a remarkably good record, whatever else you've heard, and was Dylan's last to sound like a bunch of people playing in the same room until Love & Theft in 2001. There was no sleek shine to this production, and consequently it breathed with the passion found in much of the man's best work. Unfortunately, many of the finest recordings from these sessions were not released on that album. In particular, "Yonder Comes Sin" and "Caribbean Wind" are absolutely essential, and "Heart of Mine" was recorded in a much better rendition than the one that appears on the official release. Outside of these classics, more minor gems were recorded. No collection of Dylan outtakes would be complete without these covers of "Mystery Train" and "Let It Be Me." 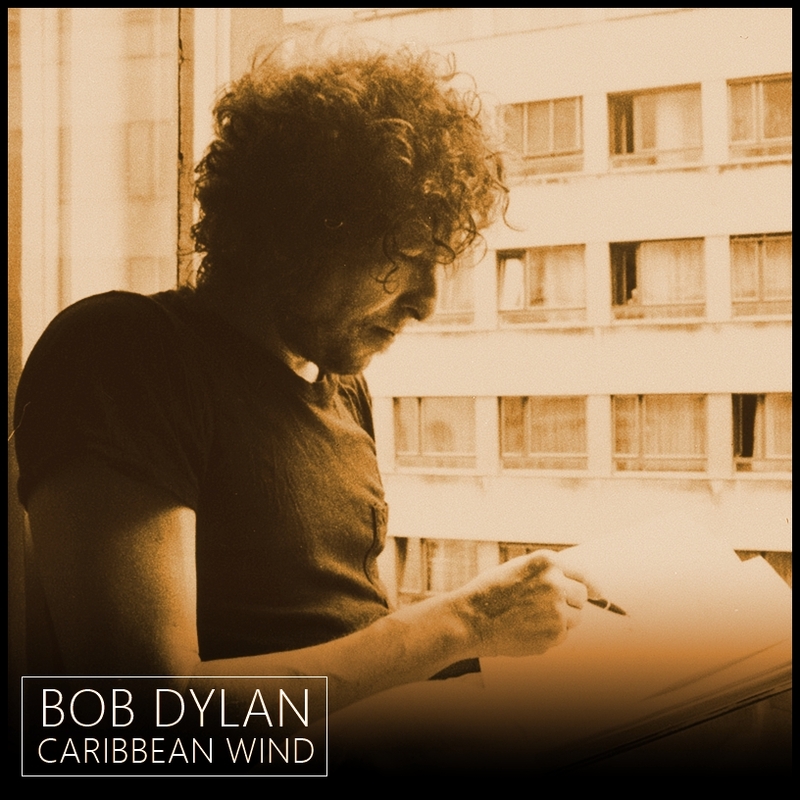 The fragmentary songs, including "Hallelujah" (not the Leonard Cohen song) and "Borrowed Time" make one wonder what could have been; "Is It Worth It" and "Ah Ah Ah Ah (High Away)" point to the reggae-influenced road ahead to Infidels, and contribute to the overall Caribbean sound of this era. The other studio cuts are intriguing as well. "Let's Keep It Between Us" is a fairly recently unearthed prototype for a song that would become transcendent on the road in Fall, 1980; you can find a live recording of the song on Rise Again: Live, Fall 1980. The rough mixes of "Dead Man, Dead Man," "Watered-Down Love," and "In The Summertime" are all interesting, but "Watered-Down Love" stands above the others, retaining an extra verse not present on the official release but conspicuous in live performances from 1981. It's likely that, like the longer version of "Dead Man, Dead Man" that appears on 2017's Trouble No More, this extra verse was cut for time constraints on the 1981 Shot of Love LP. "In The Summertime," too, stands out for the inclusion of a mournful harmonica that extends the song by a full minute beyond its officially released version. A handful of songs have been cut from this updated publication of an earlier Thousand Highways compilation. Of these, "The Groom's Still Waiting At The Altar" was abandoned for its similarity to the officially released studio performance; the only difference was an extended conclusion in which the band eventually stops playing. Live recordings have also been omitted to improve the sense of cohesion. An extended two-disc collection representing the 1981 tours will cover this material. I hope you enjoy this newest compilation, and include it in your collections alongside the inimitable Shot of Love and extraordinary Trouble No More. It was a blast to put together. Until next time, keep yourself healthy and listen to some good tunes. 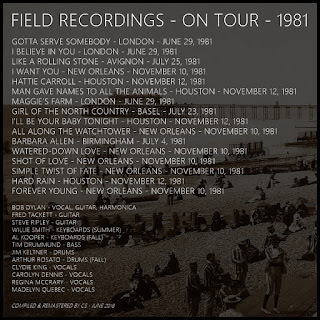 Note: Links have been removed for the moment, as a kindly commenter brought a significant error to my attention - the so-called rough mix of Dead Man, Dead Man included here is actually a live performance of the song from New Orleans. 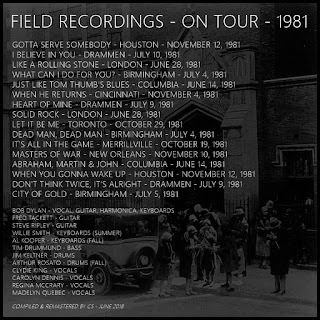 This was included on a rare official CD (Live 1961-2000) and as such cannot be hosted on my website. A new version of Caribbean Wind will be forthcoming.